Lately the Annotea server which is a public server provided by W3C for testing Annotea project is down (i don't know the reason), but i need that server for my thesis project, so i sent an email to their mailing list, but nobody in charge of that server replied. Instead, i got an offer by Urs Holzer to use his Annotea server which works just like the official W3C server. It's a great help, since my thesis is very dependent on the availability of the Annotea server as it holds the data there. With this help, i can continue working on my thesis again. I called something like this the power of community. We share our knowledge and resources with others and someday, we would get a positive feedback on our knowlede and resource which can be used to improve ourselves. It's like mutual partnership. It's a win win solution. This is how most Open Source projects grew. They share their codes and in return, people review, test, and submit patches, enhancement that will make the software better. By sharing your codes, you also put trust to other people as well.. It's quite big requirement, mostly for offline usage (10 GB ??). Another alternative for Google Sky and this application is Stellarium or WikiSky, which is also an open source application. If you are interested, please use this download link (Rapidshare). Finally, they approved my request after i sent them proof that i'm the real owner of the card. Will this be a good indication for further requests? Well, if they support PayPal, i will be glad, since it hides your credit card number, so most sites (and users) are happy with them. Here's another reason why blogging is good : It's good for your health. Read the rest of the article on SCIAM (it's not allowed to reproduce in whole or in part without permission, so i just gave you the link). Yesterday, KDE released their first Beta release towards KDE 4.1 that is planned to be released on July 29. It's aimed for testers, community members and enthusiasts in order to identify bugs and regressions, so that 4.1 can fully replace KDE 3 for end users. Lots of changes has been integrated in this beta release (it's not yet final as their TODO list is still being worked on). You might want to see the announcement on their official website. Good by my AoC monitor who has accompanied me for over than 7 years (i bought that monitor when i entered my college). I will repair that monitor and if it can be fixed, perhaps my girlfriend will use it (she has 15' in her house and mine is 17'). On day 4, i was planning to see UEFA Champion League because MU was playing against their rival, Chelsea. I slept earlier and was hoping that i could get up at 2 AM because it's when the match started. Well, i didn't set any alarm, because it would woke up the other (who didn't like watching football). Lucky me, i could woke up at 2 AM sharp and turned on the TV. It was broadcasted by RCTI, but i can also see it in star sport, since the hotel subscribed to TV Cable. One problem solved, another one come up. I watched the match silently (mute) because i would woke the other people if i don't do that (you know how football fans behave when there's a goal). Well, 90 minutes of official match plus 2x15 extra time and shoot-out penalty, finally MU won the match and i went to bed around 4.30 AM. In the morning, we were packing our stuffs because we would leave Surabaya at 3 PM. We put our luggage at the hotel because the checkout time was 12 PM. We went to Delta because it's too far to go to other places and finally we went to Jogja by train around 3.10 PM. Today is registration day for short semester in my campus. I have been assigned to teach Software Engineering class for both Computer Science and Information System faculty. The materials are already finished, but i will need some adjustment due to the unexpected things i saw today. Last month, the faculty asked students to filled in a form and write down what subject that should be opened in short semester. That form was being used as a parameter for discussion before the short semester opened. Because the students that were interested beyond the minimum requirement, it was decided to be opened. I was on my way to the campus, so i told him to wait for me at the campus. When i arrived, it was very crowded. I entered the lab where the registration took place. Students were asking for more capacity for my class, and i decided to make new adjustment again to 60 and 50. I couldn't fulfill all of their request to add more, since with limited time, it's impossible to finish all the correction done in just few days and also since this class has a project, i need time for presentation. More students means i need more time, so i set the maximum limit and no more adjustment. Not much i wanted to talk about in my third day of my vacation in Surabaya. I was pretty sure that my inbox would be filled with lots of email messages from my friends and also from mailing list that i subscribed to. While i didn't bring my laptop with me, i need to find an easy way to monitor my inbox. The only media i had was my cellphone that already accompanied me since 2002 (it's been six years). In the past, i have tried GMail Mobile Access, but it refused my cellphone since it didn't support HTTPS protocol (it didn't have mobile browser like most modern cellphone, so it's very limited). When i was waiting for the other to shop, i tried to connect to my GMail account again with a little hope that they would have changed their system to permit non-secure connection. Guess what? They did!!! GMail now permits you to connect via insecure connection with a warning after you input your username and password. By using GPRS connection (i used Telkomsel), i can monitor my inbox everywhere, thanks to new policy of GMail. I can also reply, delete, or trash any messages on my inbox just when i accessed it via web browser, but with a limited features. The rate was very cheap. Since GMail displayed 10 messages per screen, i need to load the page 15 times and it only charged me around 1000 IDR (note that i only look into my inbox, not looking at each messages). Actually, you can also use GMail Mobile Access on your browser, mostly if you are using slower connection. It will display all your email messages just like it was displayed in cellphones, so it uses very simple interface. My trip continued and second day's target was Pasar Atom. We got a ride from a friend (a couple) of my girlfriend's mother so we don't need to spent money to use taxi (even though it's not too far from our hotel). While i was on my way to Pasar Atom, i talked with the guy who took us a ride and he was talking about IT (he was working in Finance section though). He asked whether i knew about Navision or not. I said no, and he explained what it is. At that time, i didn't have any idea what that is, but when i went back to Jogja, i tried to get an information about the application and it was called Navision before Microsoft bought it and rename it to Microsoft Dynamics NAV. When i last visited Pasar Atom, there was only one Pasar Atom, which didn't have AC (air conditioner) yet. Now, it has two version of Pasar Atom (the new one has AC) but both of them are interconnected, so it's located in one big area. I met two of my students here, which went there together. We traveled along all the shops there and we also bought lots of foods for people in Jogja. We were in Pasar Atom until 4 PM, because it's closed at 5 PM (i don't know why it closed so early). We went back to the hotel and take some rest before we went to Delta Plaza which was adjacent with the hotel. It would take less than 5 minutes of walking to go to Delta on foot. As usual, i tried to find a book store on Pasar Atom and i found Gramedia. I bought one book on this book store, which was History of China. On this book store, i also found an interesting education tools which can read book content and equipped with speech devices to say the pointed text using some kind of pen. It was said that the device can read all kind of book published by several publisher which has a contract with the developer of the device. It's very handy to teach small kids how to spell English or Chinese language. The price was about 1.5 million IDR. At Delta, i also bought new sandals, because mine was about to broke. I went to Sports Station and buy a black Reebok sandals which fit on my feet. Lucky me, there was a promotion on that store, so i got 20% off and that day was the last day. So my first story began when i left Jogja to Surabaya last Monday using Sancaka at 7.30 AM. We were leaving from Tugu train station because it's near my house. We arrived there at 7.15 AM, so we still have plenty of time before the train departed. We get on the train and we were a little bit surprised when we saw Amien Rais was on the train. It appears that he's not leaving Jogja, but his relatives did (his daughter i guess). After unpacking our stuffs at the hotel, we went down and ordered a blue bird to go to Supermall Pakuwon Indah SPI. It was big and quite far from our hotel. It took us about 20 minutes (my rough estimation) to reached Pakuwon which was a big mall, just like TP. In this mall (actually it's not only in this mall), i saw an interesting thing about their book store (Tri Megah Book Store, but also in Gramedia in other malls). They dare to uncover one book as a sample book (not all books though) so people could see what's inside the book before they buy it. Sometimes, people wanted to buy books, but they wanted to see what's inside the book first to know exactly the content of the book (mostly for references and imported books because it's expensive). They also provide some seats for people to sit down and have some time reading books without having to stand up for hours. I also saw a higher reading habit in Surabaya rather than in Jogja, mostly for books that requires more concentration. Maybe it's the effect of the sample book i mentioned above. Perhaps Gramedia in Jogja should try this out for several of their books. Give people a chance to take a peek on the book and if they like the book, they will buy the book, since it's inefficient to go to the book store just to read per chapter every day and people usually won't have much time to read the whole book in one day. Pakuwon was a great mall, but i guess they lack of E-Directory services. New people (like me) who haven't been there will be confused and find it harder to shop if we don't know what's in the mall. Also if we get separated, we don't know a good meeting point. By providing a E-Directory services, we will know what floor are we now, how to get to area 1, or any other direction that would help us. 21 Cineplex has changed it's website. It's way better than the old black style and it has more contents rather than displaying the current and future movies. The interface is good, but i think they have too many unused steps. Look at the SEARCH MOVIE part. You will be asked name of the city, then name of the theater, and then, name of the movies being played at that theater. When you clicked GO, you will see all of the movies listed on that theater (the movie you selected will be highlighted in red though). It's something useless when you can do that in one or two clicks by looking at the theater section. They added trailer links in each movies, which is a huge improvements on the website. People could see the trailer before the movies are available on the theater. Too bad the full screen option is not yet working (a bug probably?). Several new sections are Slow Motion, The Stars, 21 Exclusive, and Gallery, which are more like a news portal and biography site. It's not completely related with the movie theater, but it does provide some information about artists. It has 11 errors on the main page (checked with HTML Validator Extension) and 23 Accessibility errors (checked using Wave WebAim). I'm sure most of the errors can be fixed by the developer. The question is are they willing to fix it? I'd say 8/10. What's your opinion Thomas? Finally, after four days without Internet connection (i didn't bring my laptop too) in Surabaya, i'm back here in Jogja at 8.20 PM using Sancaka (train). I feel so strange for being out of Internet, even though it's only for four days. It's a great vacation and good for me too, since i never had quite a long vacation before, so it's my chance while i'm not too busy. It's also a great chance to see Surabaya after my last visit many years ago. I have seen lots of things here and i have recorded some interesting points on my mobile phone to be posted on my blog in the following days (it will be like a short summary of what i saw in this city). By the way, congratulations for Manchester United for their double title this year (EPL and Champion League). Even though you didn't repeat the treble title this year, it's been an outstanding performance you have shown us from the beginning of this season until the end of the title race. You deserved the title. Finally i can download Fedora 9 DVD from UGM. In the last few days, i have been trying to download the ISO from my campus and from my house, but it all failed. So last Sunday, when i had a class, i took my laptop and download via WiFI provided by UGM and i can download it directly from their repo with approximately less than one hour (3,3 GB). The speed varies, but it's faster than 800 KB/s (since it's considered local network in UGM). Normally, people waited for Service Pack to include the latest protection for their Windows operating system, but in some cases, Service Pack sometimes caused troubles, thus people are afraid of installing SP and they prefer to wait for public review first. 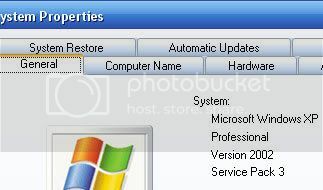 Few weeks ago, Windows XP SP 3 has been officially released (after having several delays, as usual) and like always, i have download it, but i didn't install it directly on my computer. I'd prefer to wait for public reports whether it would cause new problems or not. After waiting for few weeks, i finally decided to install the latest SP into my desktop and laptop. The process is faster than installing SP 2 (perhaps because SP 2 introduces quite a big changes compared to SP 3 which focused mainly on security fixes only). All i need is double clicking the .exe file and let the installer do the rest. After the process is finished, it asked for a restart (which can be postponed if you are still busy doing your activities). Upon restarting your system, your system will finish the upgrade process and finally, your system will have Service Pack 3 installed perfectly. I found no problem at all after installing this Service Pack, so i guess it's relatively a smooth upgrade process compared to SP 2. Please note that by installing SP 3 doesn't mean that you are 100% safe, as security threats are evolving very fast. SP 3 only help you to reduce the risk, but it won't swap all the potential risk that can affect you. In Yahoo Messenger, every time you press ESC (escape) keys on your keyboard, it will close the current chat window (not the main application though), very handy for closing unwanted chat session (if you have too many of them in your screen). This feature was not available in Pidgin 2.4.1 and previous version. Well, that's about to change as in 2.4.2, Pidgin developers has added a shortcut to close the window by using ESC keys. To do that, open Tools > Preferences > Interface. Look at the bottom of the screen and tick the option "Close conversations with Escape key". By using this shortcut, it's getting more usable and it saves time (not much though). Well, it seems that i haven't take any vacation for some time and i think next week is a good time to do that since my class will start next month and i have finished the material for the whole semester along with the assignments. I can have a relaxing vacation there. It will be a four day trip and i don't think i can access my emails while i'm there, so i'm sorry for long replies if you send me a message on the next four days. I will reply it as soon as possible. For those who registered to Indonesian Linux Forum and still in pending, please check your inbox (or probably in the BULK or SPAM folders) for the email confirmation to activate your account. Please mail the other admin while i'm in Surabaya. I will take care of it as soon as i came back. Alpha and Beta version has been released, so this time, it's time for RC to show up. Yes, the first Release Candidate of Firefox 3.0 has been released today. You can download them here and look for the release notes here. The strange thing is that the release notes didn't highlight the new feature or updated features since last beta. Nowadays, a little saving can mean a lot. This is what Intel tried to accomplish by making LessWatts project that tries to give you application, tricks, and any other resources that can help you save real watts. However, it's intended for Linux platform. It's a sad news for all of Indonesian badminton's lovers, since the men team has lost 3-0 to South Korean and they didn't reach the final as expected. It's a big loss, since most people will predict that they would reach the final like the women team who beat Germany yesterday to advance to final against China. I myself didn't watch the matches, since i was watching Narnia: The prince of Caspian at movie theater. My friend was very disappointed, since Indonesia lost and he already refused my invitation to watched Narnia today. By the way, the second Narnia movie was far way better than the first one. They really worked hard to make this movie and i think it's worthed. The special effects, the story, the battle (some of them are funny though). Everything is nice and i think you should see this movie (even for those who disappointed with the first Narnia movie). Not only that, Design99 are giving away a shiny MacBook for the Best Logo Design or web design. Interested joining? I have been using rapidshare for few months, but i have never been able to download at full speed even though my bandwidth is 1 Mbps now (Thanks to Speedy). Theoretically, i can have up to 128 KB/s, but until today, i always got 40-50 KB/s at maximum. Even though i'm not fans of Fedora, but i think many people loves this distribution (most of them are Red-Hat lovers), so it's worthed to mentioned that Fedora 9 (codename : Sulphur) has been released. The press release is here and the release summary is here (brief), while the release notes is here (detailed). To get the latest ISOs, you can use direct download, torrents, or even Jigdo. All the information you need can be obtained via this page. I'm downloading it right on my campus workstation and i think my friend will contact me shortly after he saw this post Be patients, as they have 6 CDs for the ISOs. Another earthquake has happened. This time, it happened in Central China with a magnitude of 7.9 (it was way bigger than what happened in Jogja two years ago). No wonder the victims surpassed 18000 peoples (and still counting). The tragedy struck at 2:28 p.m. (0728 GMT, 0228 ET) Monday, was the largest the region has seen "for over a generation." What impress me is that even with this kind of tragedy, they haven't asked any other country to help them, even though US is willing to help them. They have a good disaster-response mechanisms of its own and so far, i see them quite effective. Tonight, i held a small party with all of the assistant of Algorithm and Programming practical class in Pizza Hut to celebrate the end for this semester. We had dinner together and have a nice chat and at the end, they gave me a present for my birthday last month. It was an unexpected surprise. Thanks for the presents, i really appreciate it. Thank you also for the good cooperation for this semester and i hope we will meet again next semester. Finally, after 38 matches, the champion for EPL 2007/2008 has finally been decided after the last match tonight and it's the Manchester United who defended their title and got their 10th title. Thanks to C. Ronaldo and R. Giggs, MU beat Wigan on away match. Chelsea had a drew with Bolton 1-1, so they will only got one point from the match, which is surely not enough to win the title race this season. Meanwhile, Manchester City was crushed by Middlesbrough 8-1. I think it's the worst match Swen has ever played on his record. Birmingham C. 4 - 1 Blackburn R.
Chelsea       1 - 1 Bolton W.
Everton       3 - 1 Newcastle U.
Middlesbrough 8 - 1 Manchester C.
Wigan Athletic 0 - 2 Manchester U. Lately, i found out that Pidgin have some problems with their status changer. Sometimes, i changed my status and my contact list didn't see my new status. They will see the new status when they logged out and logged in again (but they will not see my new status if i changed it again). Few days ago, i tried to install MusicTracker and also AmarokPidgin that does the same thing, change my Pidgin status based on the song title i played on amaroK. AmarokPidgin does work on my system, even though a little bit of hacking is required, but the new status won't be visible to other people (only when they sign in again). I don't know whether it's pidgin's bug or not, but i do hope it will be fixed in the newer version of Pidgin with an updated of meanwhile project. For those who have just upgraded to kernel 2.6.25.2, get ready to do another recompile, since another new -Stable has just been released by the -Stable team today. It was released due to two security bugs fixed that just recently were made public. So go grab them now at their website. I only have upgraded my kernel on my office workstation. I'm still using 2.6.25 on my laptop and on my desktop at home currently. So far, it has been proven to be stable enough, so i have no big reason to recompile a new one, but i'll think about it later on. Teaching short semester is not always a simple task. Sometimes, i have to think harder, mostly when giving assignments, since the duration is very short (only three weeks, including mid test and also final test). When the class is practical class, it's even harder, since two weeks is very short and we can't give too much complicated task compared to one full semester (approximately four to five months). This month, my faculty is holding infocamp, which is a simulation for students to work on real projects for a week. They will be quarantined for a week in our campus' guest house in Kaliurang and there, they will work in teams to build a project that are taken from real life problems. Hopefully, they will get benefits from this kind of training and workshops and if the interest are quite high, we might held this kind of events each year. As you already know, current Firefox version (2.0.x) consumes too much memory (even when it's being idle). Several improvements have been designed to reduce this memory usage and it will be available when Firefox 3.0 shipped. Meanwhile, for you who wanted to optimize Firefox's performance, you can try this tools : Firefox Ultimate Optimizer (via Antonius Rachmat). It's a tool which can work silently to reduce Firefox's memory usage, thus frees your system with heavy memory loads. Too bad, it only available in Windows platform and it requires .NET 2.0 to be installed I boot to Linux more often than Windows, so i can't use this application. It's very nice application though. Currently, this application doesn't have any configuration yet, so you can't tweak anything. One more weakness about this application is that the icon can't be hidden, so it will be on your task bar all the time. Future version might solve this, but i'm not sure yet (i'm not the developer). My job for this semester is finished. All i need is to submit the grades. Right now, i'm preparing for my next class in short semester which will start next June (not in May like in my previous post). The material will be updated from last year's material and i hope students will find it more interesting (and more discussion class). There's also a new mechanism for the tasks and scoring (it's still classified), so just wait and see the surprise next month . I tried to find better scheme each time new semester comes up. It has benefits for me and also for the students, because they won't get the same method each time they took my class. Few years ago, we lives in Gigabyte era. Currently, we are evolving to terabyte (1000 gigabytes) and soon, we will reach petabyte (1000 terabytes). But big industries have evolves more than home users. HP predicted that in 2013, yottabyte, or 1,000 zettabytes of storage capacity will arrive and become public usage. OpenOffice.org Team via John McCreesh has announced the availability of the first beta release of OpenOffice.org 3.0, which is planned to be released as final version on next September. The purpose of this beta version is to get public feedback from all users and test the next major version of OpenOffice.org. As it is a major version, new big things have been integrated on this version, for example new "Start Centre", new fresh-looking icons, and a new zoom control in the status bar. Notable Calc improvements include a new solver component; support for spreadsheet collaboration through workbook sharing; and an increase to 1024 columns per sheet. Writer has an improved notes feature and displays of multiple pages while editing. There are numerous Chart enhancements, and an improved crop feature in Draw and Impress. One nice feature in the upcoming OOo 3.0 Beta is the support for multi monitor support in Impress, so that presenters can look at something else while presenting their slides on a projector. With the upcoming Presenter Console Extension, this feature can be exploited to its maximum because then presenters will be able to see their next slides as well as the time and the speaker notes. This is very useful for presentation. For those who wanted to try this new extension, grab them here. People who are used to DreamWeaver sometimes complaints that there are equivalent application in Linux that can replace DreamWeaver. It also happened with workshop attendance that was held from last Monday until next Friday at my campus. They asked to be taught by using DreamWeaver, but my colleague, Budi Susanto decided to use KompoZer, a web authoring system which already support WYSIWYG feature, like DreamWeaver had. KompoZer is based on Nvu, developed by Daniel Glazman and Linspire and also take some part from Mozilla engine (which Nvu based on). Months after months of developing and now they (PHP Team) have released PHP 5.2.6 which fixed lots of bugs since 5.2.5 (some are security fixes), so it's recommended to upgrade to the latest version. I was really hoping that this version can come out before Slackware 12.1 is released, but who knows when will it be released anyways. I'm sure PV will include this in the first Slackware-Stable update. In January and February, Linux Journal has asked people to vote for their favorite application and today, they announced the winner (and also the Honorable Mentions that deserves to be named, even though not able to win). You will see some common application dominate the votes, like OpenOffice.org in office application, Apache in web server category, Firefox in browser category, and many more. There are also some close battle, like GNOME vs KDE which is always competitive (this time GNOME won by 3,2% over KDE). For complete list, please visit their page. It's interesting to see this kind of voting as each year, most of the components changed and it's good reference for new people who wanted to migrate to Linux. For example, people often asked "What Linux distribution should i use for newbie?" By looking at the results, it's probably wise to recommend Ubuntu (even though i'm Slackware users) for that person (the final decision is on his/her hand though). This morning, i attended first class on my third semester for my master degree. Last night, i saw the schedule and it seems that there won't be any lab class this semester. So every Saturday and Weekend, the class will ended at around 1.30 PM at most. In the last previous two semesters, we had lab class, so sometimes, we finished around 4 PM. After few weeks being cooked at Blogger Draft, finally the scheduling post feature is ready for public usage and it has been integrated by the Blogger team. It means that you can write your post today and ask Blogger to publish it anytime you like in the future (be it in one hour, one day, one week, you name it as long as it's in the future). I just came back from watching Iron Man 2008 at 21Cineplex (no more complaining this time. It's just that i got there quite late, so i had to queue for some time before i get the tickets). It was a magnificent movie (it's worthed to queue for this movie). It combines Technology and also Special Effects to create this two hours movie. I'm waiting for Narnia: Prince of Caspian which should be on the movie theater starting 16 May. I hope it's better than the first one (ohh dear... it should be a big hit, but it's far from many people had thought). By doing this, it will make Flash development and usage increased in Open Source community as they will have wider access for developing technologies that relies and/or uses Flash format. It's not easy to open access technology that is core to business process. Adobe can do it, so why can't the others?